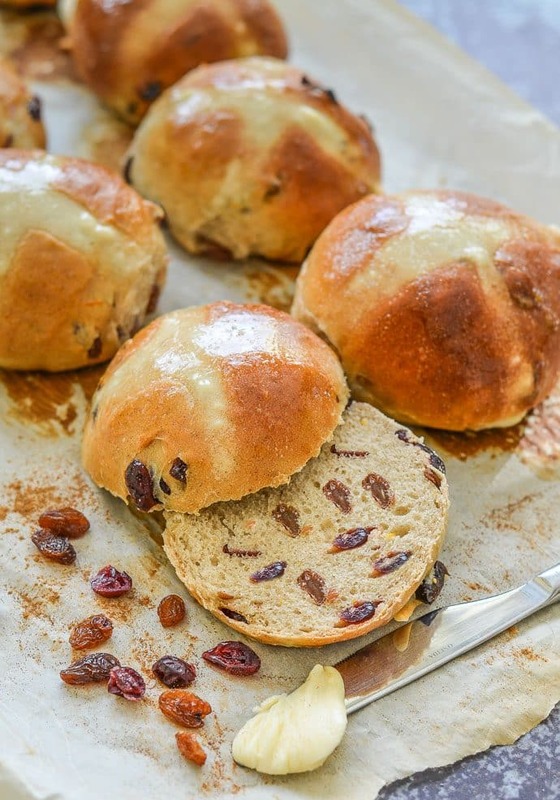 Indulge yourself this Easter, with these fruit flecked, fragrant & lightly sweetened Vegan Hot Cross Buns. Perfect warm from the oven, or gently toasted! Ok, I can eat Vegan Hot Cross Buns all day if I must. And I have been. I re-tested my Easy No Knead Hot Cross Buns recipe last week as it has been around for a long while and I wanted to give it a few little tweaks. Then I had to get working on these right after. It’s been Hot Cross Bun central in our house ever since, which I’m certainly not complaining about because I freely admit that I am a carb-o-holic. And carbs don’t get any better than when they are in the form of a fragrant, fruit flecked, sticky Hot Cross Bun slathered in Homemade Vegan Butter. 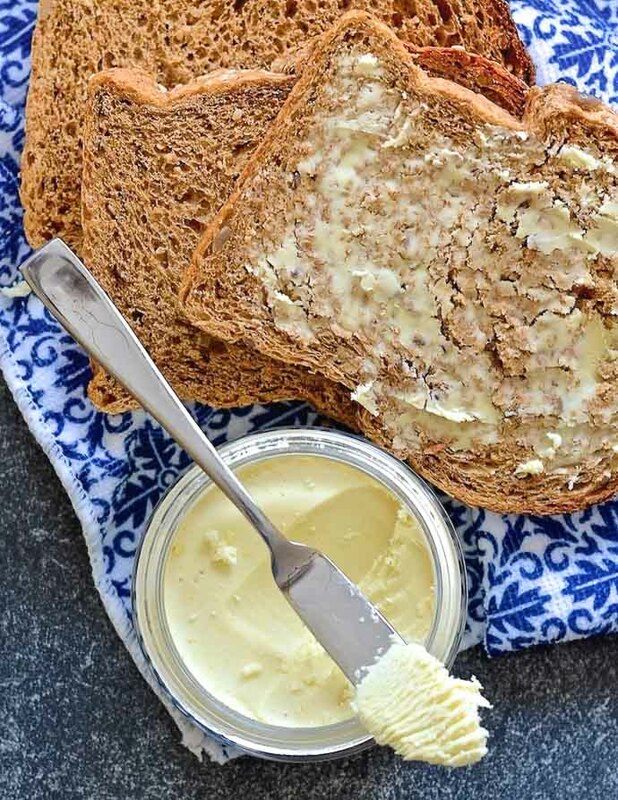 If you haven’t given my butter recipe a try yet, do yourself a favour and make it in combo with these buns. You won’t regret it! 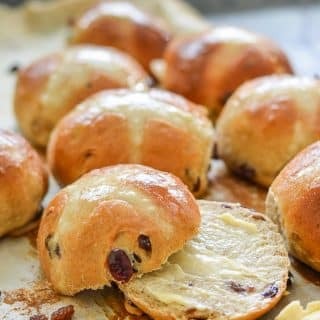 These Vegan Hot Cross Buns are pretty easy to make. Please don’t be intimidated by them. But if you just can’t help yourself, then my No Knead version is the answer to your prayers. Just do it. 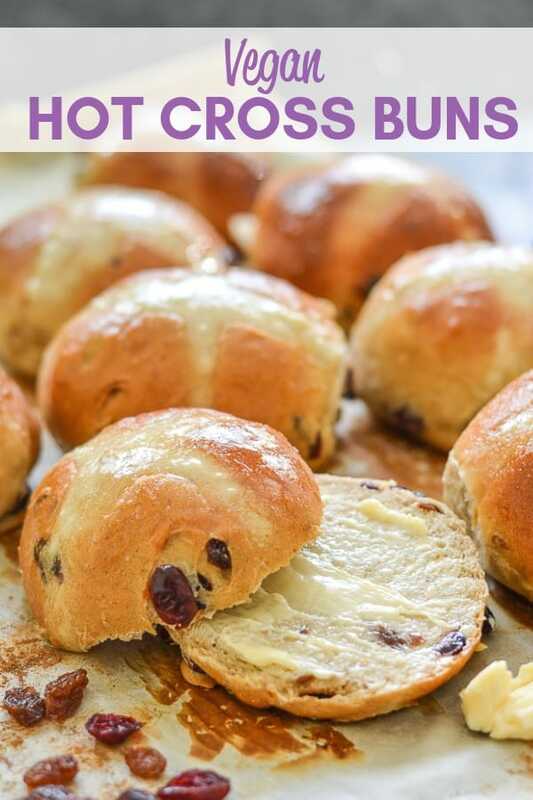 Whichever way you prefer, but make some Hot Cross buns already, because it’s Easter and you need them in your life! If kneading is something that really doesn’t appeal to you then a stand mixer is what you want. They make light work of mixing and kneading dough. I wouldn’t be without my shiny, red Kitchen Aid. Making your own Vegan Hot Cross Buns isn’t difficult but it does take a few hours. Almost all of that is hands off time though so don’t panic, and you can see my step by step video just above the recipe card for a more visual reference. Put all of the dry ingredients including the orange zest, but NOT the dried fruit, into the bowl of your stand mixer, or a large mixing bowl if you are making the buns by hand. Add the liquids to the dry ingredients with the melted vegan butter/coconut oil. Mix everything up well, then knead the dough until smooth and elastic. Once it’s smooth, add the dried fruit and carry on kneading for a minute until it’s incorporated. Adding it a little later stops it getting all mangled up. Lightly oil a bowl and the dough, cover the bowl with a damp, clean dish towel and leave until doubled. Turn out, divide into pieces, roll into balls (they don’t have to be perfect – rustic is a good look!) and place on a baking sheet. Cover and leave for 30 minutes. Make the flour and water mixture then pipe it in cross shapes across the top. While still hot from the oven, brush with the glaze then allow to cool. 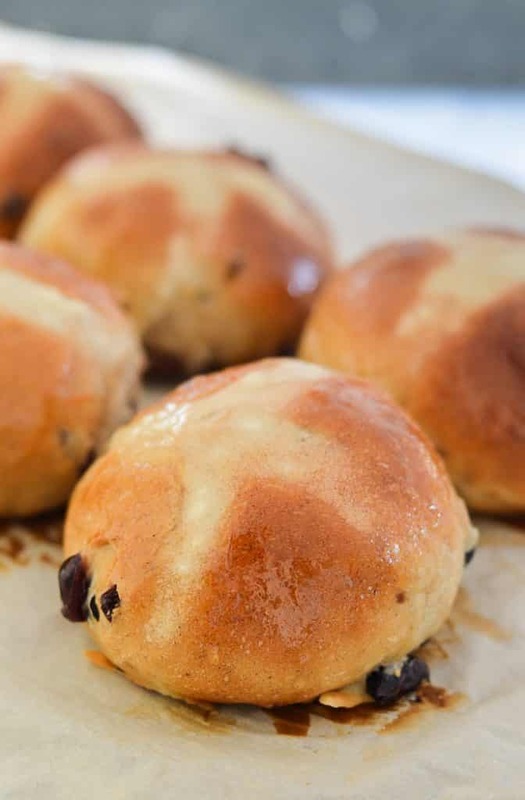 My go-to, easy glaze for Hot Cross Buns is a mixture of equal parts sugar and boiling water. You just need to stir it until the sugar dissolves and it is ready to go. For this recipe 2 tablespoons of sugar and 2 tablespoons on water is enough. Another really good option which does have the edge on stickiness factor, is apricot jam. Warm it gently in a pan and brush it over the buns. If it’s a bit lumpy you can blend it up until smooth first. I’m lazy though so I usually just dab the brush around the lumps and get enough to do the job without blending! they are pretty easy to make and you get lots of hands off time to go put your feet up throughout the process! the sticky, slightly crusty exterior and fluffy, soft inside ???? I just had to test this out the other day. All in the name of helping you guys of course…There were no selfish, gluttonous thoughts at all… ???? Make French Toast with Hot Cross Buns! ???? Yes, cut your Hot Cross Buns in half and use them in place of the bread in my Best Vegan French Toast Recipe. Stale buns work best. 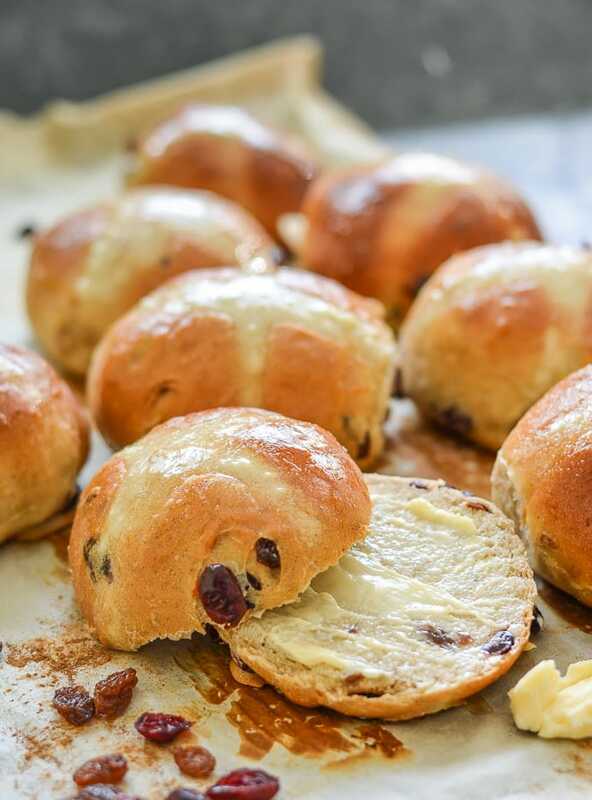 It’s so good it’s even worth doubling your Hot cross Bun batch for! Give me Hot Cross Buns over of buns of steel any day ???? 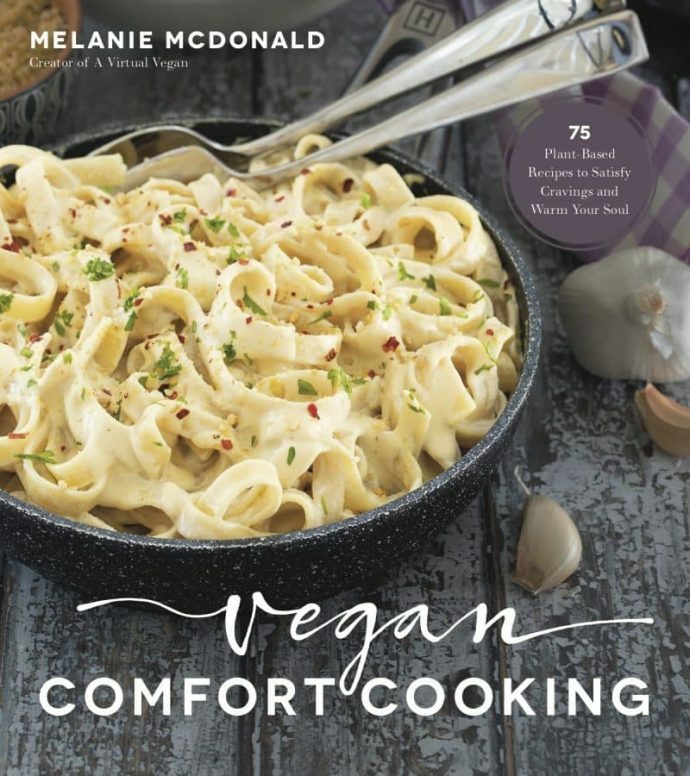 4 tablespoons vegan butter or coconut oil, melted and room temperature. It must NOT be hot. Put the flour, yeast, salt, cinnamon, nutmeg, sugar and zest into the bowl of a stand mixer and stir to combine them all. Squeeze the juice of the orange into the measured water and add that along with the milk and butter. With the dough hook in place, turn on the stand mixer. I use speed 2 with mine. Knead for around 8 minutes in the stand mixer, or about 15 minutes by hand. The dough needs to be completely smooth and elastic. You will notice when you start that if you stretch the dough it will tear. By the time you have finished it should stretch really easily with no tearing. 3-4 minutes into kneading, turn the mixer off and give the dough a poke with your finger. It should be tacky but not overly sticky. If it's too sticky add another couple tablespoons of flour, if it's dry, add a tablespoon or two of water. Don't overdo it with adding more flour though. The drier the dough, the dryer the finished buns will be. Once it’s smooth, add the dried fruit and carry on kneading for a minute or two until it’s incorporated. Grease a bowl with a drop of oil or some oil spray, and put the dough in it, move it all around on all sides to coat the dough ball in the oil. This stops a skin forming on the dough and means it will rise better. I tend to use the bowl I mixed the dough in to save dirtying another. I just scoop the dough out and hold it in one hand, then pour a little oil into the bowl with the other then put the dough back. Cover with a damp, clean dish towel (just run it under the tap for a few second then wring it out) and leave on the kitchen counter until doubled. The time this takes will vary depending on how warm your kitchen is but bear in mind that the longer it takes to rise, the more flavour there will be so unless you are in a hurry, don’t rush it by cranking up the heating or putting it somewhere very warm. Mine generally takes between 60 - 90 minutes to double and my kitchen is usually between 17-18°C. Once the dough has doubled scrape it gently onto a clean, lightly floured work surface. Be careful not to tear it as you do this. Shape it loosely into a round, then cut it into 10 even pieces with a sharp knife or dough cutter. Roll into balls. See my video above to watch how I do it. 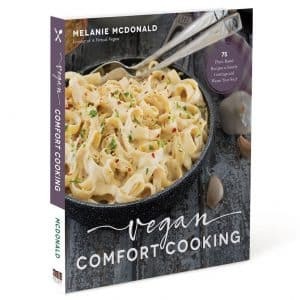 Basically I place my hands on either side of the ball and gently turn the ball of dough while pulling down from the top, stretching it slightly to make the surface taut and gathering it at the bottom. Don't worry too much though. The rustic look is good! Place each finished ball on a baking sheet with about an inch clear around them then cover with the damp dish towel again and leave on the kitchen counter again for 30 minutes. Mix the flour and water together into a thick pipe-able paste and put it in a piping bag or piping syringe. 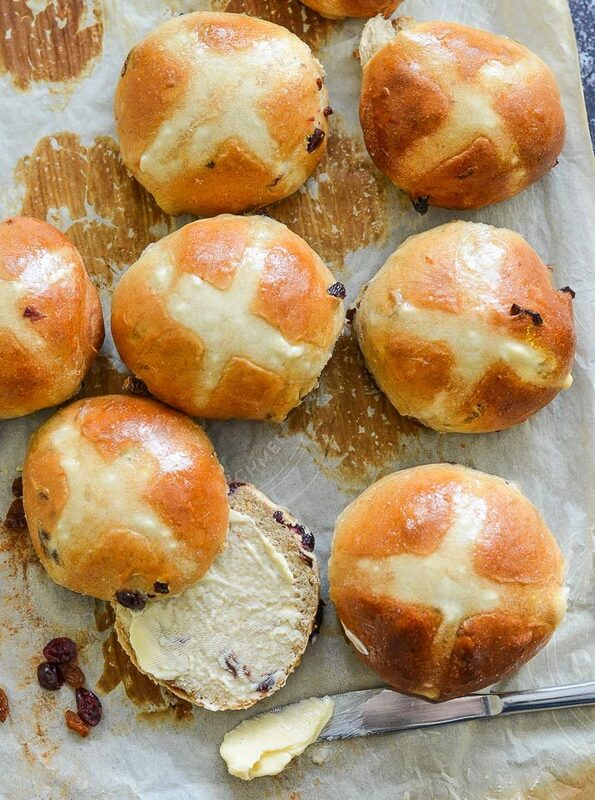 Once the buns have had 30 minutes to rest, uncover them and pipe crosses on the top. It's easier if you have lined your buns up well on the baking sheet and can just pipe in one smooth line all the way along. Once piped place in the pre-heated oven and bake for about 20 minutes, maybe another minute or two. They should be just starting to turn a little golden and if you top on the bottom of one of them it should sound hollow. While in the oven make the sugar glaze by combining the sugar with the boiling water and stirring until the sugar dissolves. Once cooked, remove the buns from the oven and immediately brush with the sugar glaze then place on a cooling rack to cool. 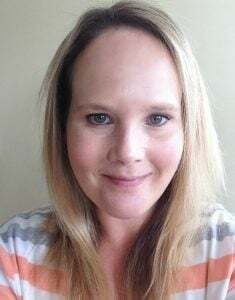 Once cooled store in a sealed container or bags. Best eaten as they are within a day or two, but once they become a little stale they toast beautifully. Also see my note in the post above about making French toast with any leftovers!